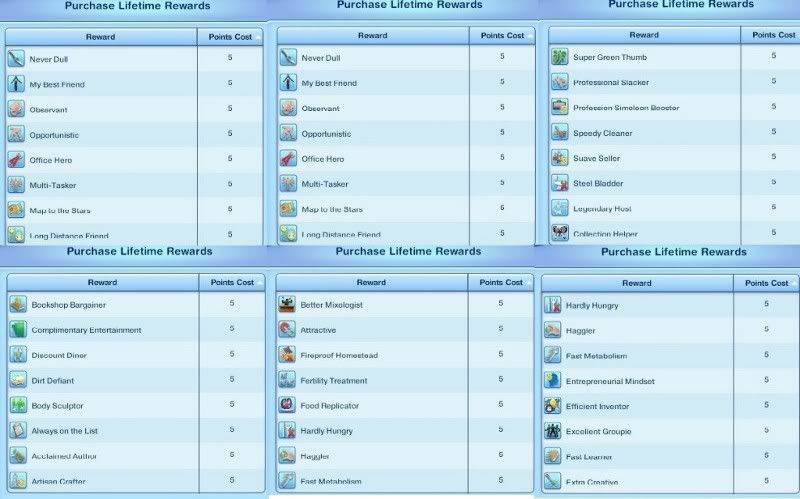 This is the updated version of my All Lifetime Happiness Rewards mod for Pets EP. It will also work for earlier EPs. It has not been tested with Pets because I currently don't have Pets installed, but the new s3pe comes with Pets included. Testers are wanted, though it works fine in a Pets free game. Enjoy! Updated: It now includes the missing rewards that I couldn't see without having Pets installed. Enjoy! It works with Pets, I just test. It not only lets the new Happiness Rewards cheap (they are two in total), I don't know how they are in English (my game is in portuguese), but it is something like "Created with animals," which costs 15,000 and "Animal expert" that costs 25,000, all the rest costs 5. Thanks so much for letting me know, I will have to wait until I get Pets which won't be too much longer then I can update it to be sure exactly which ones they are. I absolutely adore this mod! I was wondering, will it be updated for Showtime? PLEASE UPDATE THIS! it's a great mod, and i can't enjoy my game w/o it! firstly thanks for making this mod. It is awesome (obviously) and I love it. I don't want to be a pain but are there any plans to update for seasons? I do have the latest version of the mod (Supernatural) but removed it when I installed seasons incase it wasn't compatible. I have Seasons right now but it's only for converting to TS2. I can't test mods in game because my new (old) computer won't load The Sims 3. Who knows, Christmas is around the corner I might get a new laptop for Christmas (I hope).